Product of the Year USA, the largest consumer-voted award for product innovation, has just announced 2016 award winners. The winning products are selected through the votes of over 40,000 consumers in a national representative survey each year conducted by research partner TNS, a global leader in consumer research. 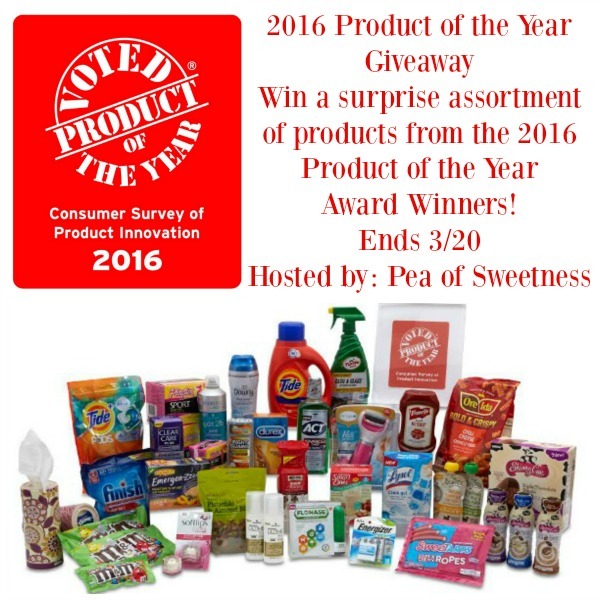 Learn more and see what Emilee at Pea of Sweetness thought of some of the 2016 Product of the Year Award Winners. Would you like to win an assortment of products from the 2016 Product of the Year Award Winners? One winner will receive a surprise assortment of products! This giveaway runs through 3/20/16 at 11:00pm Eastern Time and is open to US residents ages 18+. Winner is subject to eligibility verification and will have 48 hours to confirm before a new winner will be drawn. For any questions/concerns please email emilee.roberts (at) peaofsweetness (dot) com (consider adding this email to your “Safe List” as winning email notification will be sent from this email). Please refer to the full terms and conditions in the Giveaway Tools. Disclosure: Emilee at Pea of Sweetness received complimentary products to facilitate her review. No additional compensation was received. Any participating bloggers are not responsible for prize fulfillment. I really want to try the AMOPÉ PEDI PERFECT EXTRA COARSE ELECTRONIC FOOT FILE WITH DIAMOND CRYSTALS. My feet can use it. Already love the Skinny Cow Dipped Ice Cream Bars (soooo good!!!) and the ACT® Advanced CareTM mouthwash (it really does prevent plaque during the day). I’ve been wanting to try the Soft lips Cubes. Tide is my favorite, I think it gets my clothes really clean! Gotta Be the Emergen-Zzzzzzzz! I must try it now. I have used emergenC for when we are feeling a cold.. and I DO need help to sleep sometimes… I want to get this aSap. I would like to try ENERGIZER® ECOADVANCEDTM Energizer AA batteries. It would definitely be SCHWARZKOPF ESSENCE ULTIME OMEGA REPAIR 11-IN-1 LEAVE-IN.